I had planned on watching the race live last night from 11PM to 1AM, but after a fairly long day and too much pizza I went to bed before it started and was therefore able to watch it this morning on the DVR while avoiding the internet (and hence results), luckily I was awake enough to watch the whole thing and it really was a fun race. Perhaps though it is time to change the definition of ‘winner’ though ? Over the weekend Lewis Hamilton manage to score more ‘Hero Points’ than any driver that I can remember since the late, great James Hunt and therefore should be considered the winner this weekend. The viewers were also winners this time around after the snooze-fest last time around. This race had pretty much everything, it started out wet/damp, then there was the almost expected first lap crash that shuffled the field. A brief session behind the safety car followed and then the race proper began. During which time the track dried out and the field got shuffled a little and there was more overtaking for position than anyone could have predicted. Button ‘won’ the race by virtue of making a forced tire stop – his inters were utterly trashed and as such he had no choice, it was a gamble that paid off for him, and then having the Red Bull of Sebastian Vettel fall off the track with wheel failure, elimination any competition for him. This is the standard way that Button wins, no competition, no excitement and no interest from the fans. His race was utterly dull to watch as he serenely looked after his tires and managed the gap, doing exactly what he needed to do and absolutely nothing more. Even though he won, his race was beige and the entertainment rating for me was ‘wet weekend in Bournemouth’. Vettel drove like a man possessed and deserved something – the wheel failure was a horrible end for his day, up to that point he had built a lead and was charging ahead in fine style, he wanted to not only win, but to demoralize the opposition, especially after his technical failure last race. It was not to be though, his day ended in the gravel. Alonso drove calmly and intelligently, he drove for points and backed his (slower) teammate up to the end. A very smart drive and it demonstrated a level of maturity that we have not seen very often from Alonso. Very, very ‘Prost’. Massa was on the edge for the last half of the race and again he drove extremely well but he was holding up Alonso and letting Bob get away. A true team player would have let his faster team-mate by and hoped that he could get dragged along and maybe catch and pass the ‘not that good’ Renault, but Massa is his own man now and he fought to stay ahead of Alonso for many laps and finished ahead of him. Kind of a ‘Barrichello’ race, except that Rubens was also in the race too…..
Oh yeah, Bob, he was Mr. Invisible, slower than Button for most of the race and quicker than Massa, but slower than Alonso. Another sensible race, but that was it really, not a great deal of excitement, not quite as beige as Button, but really close. Hamilton deserved way more than he got. Add to the results a point for every car he overtook for position and he would be the winner by miles. Gutsy, brave, scary fast and inventing overtaking places that previously did not exist. Then to slam his team post race for bringing him in for an unnecessary stop afterwards was brilliant. It looks like we actually have a personality on the grid ! Sideways exits in his road car, car impounded by the cops, banging wheels with Webber, Button, Massa, Schumacher and that move on Rosberg was incredible. That he was driving most of the race with a damaged front wing yet still topping the times lap after lap was reminiscent of Senna and Schumacher at their height. This is what we want to see ! Lewis Hamilton may be on the road to becoming the new James Hunt. I hope. Hamilton scored an entertainment rating of ‘edge of the sofa’ this week out. Webbo was a nut-job. He crashed into Hamilton at least twice on camera and like Hamilton, he created opportunities all the way – he needed his knuckles wrapped over screwing up Hamilton’s move on LOLonso and denying us a Hamilton/Massa ‘who has the biggest balls’ last couple of laps battle, but other than that he was entertaining to watch. I am often critical of Werbbo because he is not as fast as Vettel and does seem to whine a lot, but in this race he added hugely to the entertainment factor. As for the rest ? 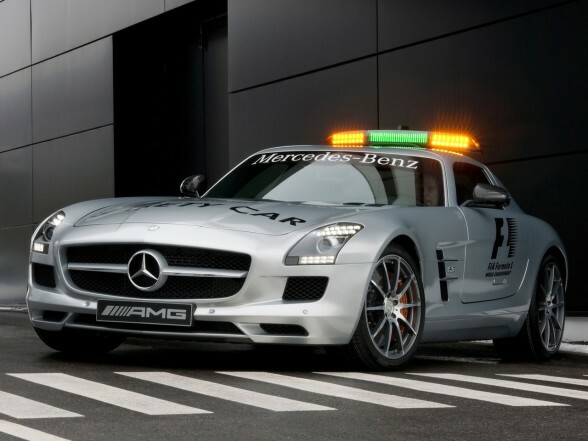 Well the new safety car rocks – it looks brilliant.